Fund permanent housing for the long-term homeless through vouchers proided by the New Jersey Department of Community Affairs. Provide supportive services to these individuals through the non-profit organization Garden State Episcopal. These services include move-in assistance, home furnishing, substance abuse recovery, physical therapy, mental health rehabilitation, and financial literacy. This innovative funding model is the first of its kind in New Jersey and one of very few in the country. This program is the first to include State, County, and Municipal governments partnering with for-profit hospitals and non-profit charitable organizations. The success of the pilot program will lead to its expansion. While the Familiar Faces pilot program will target individuals who have been without secure housing for extended periods of time, the City of Hoboken is also securing opportunities for other low income and underserved populations in our community. Historically, low income seniors and people with disabilities have been at a particularly high risk of falling through the cracks in our system. Supportive employment services to Hudson County residents with developmental disabilities to help them work towards achieving independence and full community integration. Workforce entry and reentry for individuals, especially older adults who do not have the benefit of a family network to provide financial support. Career coaches provide training and support, including resume writing, computer training, certification support, job placement, and additional support needed to succeed in a modern workforce. Services are specifically tailored to an individual's needs. While the Mitigation and Prevention components will go a long way, there is no single solution to "cure" homelessness. That's why we are rolling out programs to strengthen the existing support system for the homeless. MBS Housing, the owners of the former Hoboken YMCA, have secured a $10,000 donation to renovated space in their building for the purpose of opening Hoboken's first food pantry open to everyone. The City is partnering with the public school system to help with food drives and fundraising to support the food pantry. Eight donation meters will be placed throughout the City, provided by IPS and Hudson Pride Center. 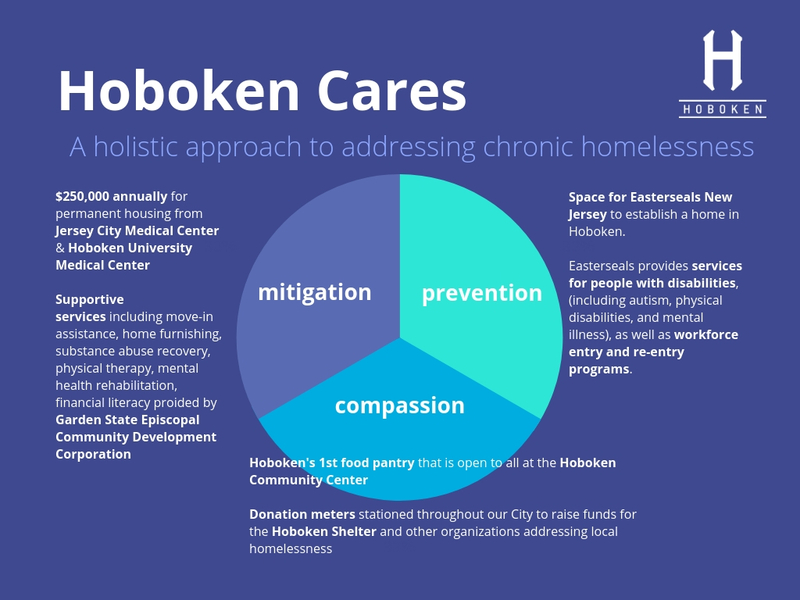 The donated funds go to the Hoboken Shelter and other local organizations serving the housing insecure, with United Way of Hudson County acting as the intermediary. Furthermore, Hoboken's Homelessness Task Force is a standing committee which meets every other month. If you, your business, or your organization would like to get involved, please contact Caroline Caulfield at ccaulfield@hobokennj.gov.